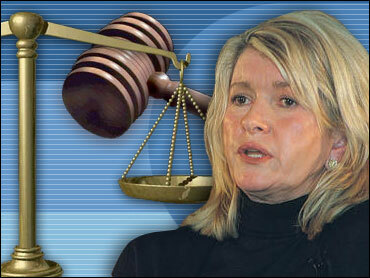 What do the Justice Department and Martha Stewart have in common? They both had a really bad Tuesday. Stewart had to go through her percale-filled day knowing that the feds are on the verge of indicting her on insider trading and obstruction of justice charges. Not only that, but the news about prosecutors' souped-up grand jury schedule broke for Stewart on the same day that her company, Martha Stewart Living Omnimedia, was holding its annual shareholders meeting in New York. So Stewart couldn't or wouldn't attend the meeting, which you just know had to kill the mother of all hostesses. Federal lawyers, meanwhile, suffered through a trifecta of fairly troubling news of their own, starting with the fallout from a critical internal report about illegal immigrants, moving on to a mixed verdict in a terror trial in Detroit, and ending with a surprisingly skeptical appellate court in Virginia hearing argument in the Zacarias Moussaoui case. The Justice Department has had plenty of very good days in and out of court since Sept. 11, 2001. Tuesday was clearly not one of those days. In fact, if the feds weren't about to indict her, you would think that Stewart might want to make all those stressed-out prosecutors and politicians at Justice a couple of nice warm scones or something just to settle them down a bit after a tough day at the office. Perhaps that will be a small part of the global settlement between the parties that I'm still betting is the end result of all the posturing over who will go after Stewart and for what. I mean, who's ever heard of a defense team leaking news of a pending indictment to the company of the executive about to be indicted only to see the company then leak the news to the rest of the world? Stewart's bad day warrants a little perspective. First, she's known for months that she is the target of both a criminal and civil investigation. If her lawyers are doing their jobs — and I bet they are — Stewart also has known for a while that the feds on any given day could go to a grand jury and get an indictment of her. So it should have come as no surprise at all to her that things might ratchet up a bit, especially if any behind-the-scenes negotiations failed to reach a deal. And that's my best guess about what's really happening. It's just a guess, mind you, but I suspect that the feds have decided to indict Stewart sooner rather than later to see whether a made-for television perp walk and mug shot — Can you just imagine catty television anchors commenting upon what she's wearing while she walks to her arraignment? — change Stewart's frame of mind enough to re-start those negotiations in earnest. Call me cynical but I just don't see Martha Stewart ever going on trial for anything other than the cruel use of wax paper. If you turned that same perspective toward the Justice Department Tuesday you might appreciate just how dismal a day it was for the feds. First, federal lawyers had to react to and live with the disturbing conclusions reached by the Department's own inspector general's office. This internal watchdog concluded that the federal law enforcement community overreacted after the terror attacks on America by making "little attempt to distinguish" between genuine terror suspects and simple immigration law violators. The later of these detainees, hardly in a position to exert much legal or political force on their own behalf, were kept in jail too long, often in harsh conditions, the report found. And when some Justice Department lawyers raised question about the treatment of these people, The New York Times reported Tuesday that those lawyers either were ignored or countermanded by their superiors. The report is bad enough for the Justice Department from a public relations point of view. After all, it's awfully hard to spin away an internal report. But just imagine how damaging the conclusions are to the department's goals when you consider the audience that matters most to federal prosecutors: federal judges. No federal judge who reads the report or is aware of it is going to give the Justice Department the same enormous benefit of the doubt that federal judges all over the country have been giving prosecutors since Sept. 11, 2001. From now on, just you watch, federal judges in all manner of terror law cases are going to ask a lot more questions and refuse to settle for fewer answers about the way the Justice Department is handling these matters. The report thus signifies the end of an era that began on Sept. 12, 2001 and ended Monday. I'm sure prosecutors are spinning the jury's conclusions as a victory — and in some sense it is. But the jury verdict also represents a strong signal from regular citizens that they aren't simply going to roll over and convict people just because the government says to. It's a verdict that is bound to embolden defense attorneys in future "material support" cases like this and thus make it tougher for prosecutors to cajole defendants into pleading out before trial. Besides, from merely an appearance-is-reality point of view, it's got to be a tough break for the Justice Department that prosecutors couldn't win a clean sweep in the very first jury trial on terrorism since the World Trade Center fell. Finally, there was the Moussaoui hearing before the 4th U.S. Circuit Court of Appeals in Richmond. If there is a more conservative appellate court in America — a court more in tune with the current Administration's legal and political views — I am not aware of it. Yet the panel that heard argument Tuesday didn't exactly phone in their approval of the government's extraordinary position that a capital defendant (Moussaoui) cannot have access in some material form to the testimony of witnesses (in this case two Al Qaeda chieftains) who could either exonerate him or generate mitigating factors during the sentencing phase of a trial. Maybe it's because the Constitution requires such access. Maybe it's because the judges know that if they turn down the Justice Department, the White House and the Pentagon can always take Moussaoui out of the federal courts and try him before a military tribunal. Or maybe it's because the appellate judges, like Moussaoui's trial judge, hate it when the executive branch comes into court and makes arrogant "don't worry your pretty little head about it" arguments in the hopes of backing off the judiciary. Whatever the case, the 4th Circuit suggested Tuesday that it may not be the pushover the Justice Department is counting on it to be.